People accused of crimes in Lakewood, Colorado, and the surrounding areas rely on Pearson & Paris, P.C., for a wide range of criminal defense matters. Our "law firm of the Rocky Mountains" is a small firm that offers personalized, compassionate attention while committing to large-firm results. With attorneys on our staff who have received numerous recognitions for their achievements and regularly contribute to the continuing education and mentoring of attorneys across the country, we are confident in our abilities to get the best results possible. Clients who are accused of crimes are likely to feel frightened, confused and even angry at their situation. They face social stigma, the loss of their livelihood and a record for life. At our law firm, we are aware of the serious and life-changing consequences a criminal conviction can present. We do not make false promises, but we do reassure clients that they will receive strenuous, knowledgeable and experienced defense both in the courtroom and out. We will answer questions honestly and assist clients and their families in understanding complex court procedures and traditions. 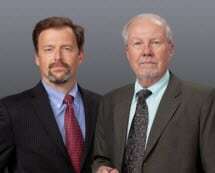 We handle such criminal defense matters as DUI, drug charges, domestic violence, assault, murder and sexual assault. Having extensive experience in both state and federal courtrooms, we are proficient in felony as well as misdemeanor cases. "At the law firm of Pearson & Paris, P.C., outstanding customer service is our primary goal, which we believe starts with the free initial consultation for our criminal cases and consultations at reduced rates for most other matters, and continues through to the resolution of the case. We accept credit cards for our clients' convenience." The Attorney's at Pearson & Pairs are amazing. The Attorney's are very knowledgeable, and experienced. If I ever need help in a situation or need advise. I will be contacting them again. Extremely knowledgable attorneys and client focused. I did not hire the law firm, but was helped by Kristen Myer who is a family friend and employed by this firm. If she is any indication of the quality of legal professionals at this firm, then Pearson & Paris is the law firm to hire. Ms. Myers did not represent me, but did help me work through some legal issues that I was facing. She is a family friend and used her knowledge and resources to provide me with the best assistance she could. While she and her firm does not practice in the area of employment law, the help rendered by her was very complete and useful. Without her help, I doubt my case would have had a positive outcome. Ms. Myers went above and beyond to help me find the appropriate legal standards I may be facing at my unemployment hearing, applicable case law, and a general overview of what to expect at the hearing. With her help and guidance, I was able to feel confident as I called in for my hearing. She is detailed oriented, and really prepared me for what I would be facing including good and bad outcomes. I want to thank her for her help. I was very happy with the representation that I received. Not only were the attorneys beyond professional, they were willing to listen to me and help me understand my situation. I will never go to another firm again. This place does everything! I would not recommend this firm. I had an attorney that was very unprofessional.. I was embarrassed having this representation. There was a big song and dance over what they could do and we came out loosing. Overpriced for the little work they did and the outcome of the case. Definatly I would look at a different firm.